Includes top, skirt, belt and hat. COAT WITH CUFF RUFFLE, BELT, DICKIE AND HAT. Includes top, pants and belt. 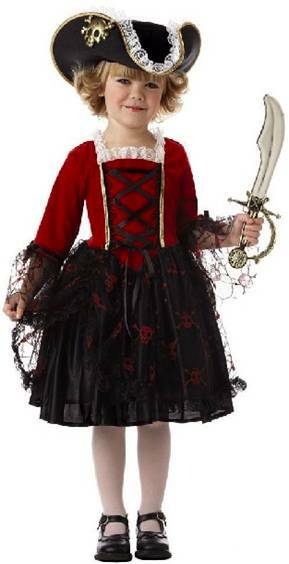 COSTUME INCLUDES BLACK VEST WITH RED/WHITE STRIPED SKIRTED DRESS WITH RUFFLED TAIL OVERSKIRT AND SKULL AND CROSSBONES BELT BUCKLE. STRIPED HEADSCARF ALSO INCLUDED. HAT, FISHNET STOCKINGS AND BOOTS SOLD SEPARATELY. Includes coat, hat and pants. 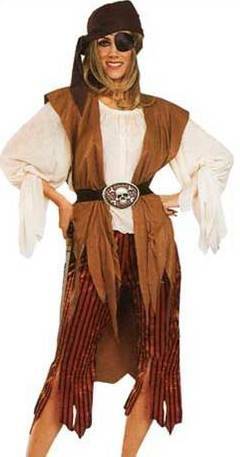 Includes top, pants, sash and headpiece. Includes dress, neck sash and hat. ALL ABOARD LITTLE PIRATE! 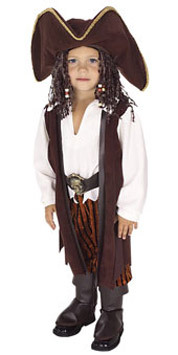 COSTUME INCLUDES HAT WITH ATTACHED YARN HAIR, JUMPSUIT WITH ATTACHED VEST, BELT AND BOOT TOPS. COSTUME INCLUDES GOLD/BLACK PEASANT TOP DRESS WITH JEWELED BROOCH. 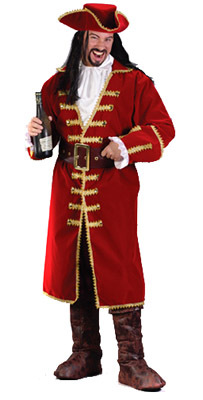 PETTICOAT, HAT, STOCKINGS AND BOOTS SOLD SEPARATELY. 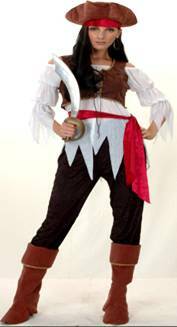 PIRATE HAT WITH THICK GOLD TRIM AND SIDE RIBBONS TOPPED WITH OSTRICH FEATHERS. 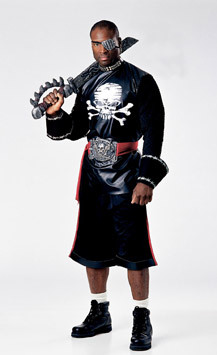 Pirate King Costume includes Lace-up Shirt, Pants, Belt with 3-D vinyl Buckle and Head Scarf. COSTUME CONSISTS OF BLACK/RED DOUBLE LACE UP CORSET DRESS. 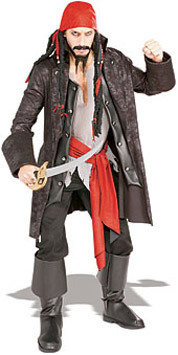 SHOWN WITH BLACK PETTICOAT AND PIRATE HAT SOLD SEPARATELY. NOTE: XL FITS WOMEN SIZE 14-16. 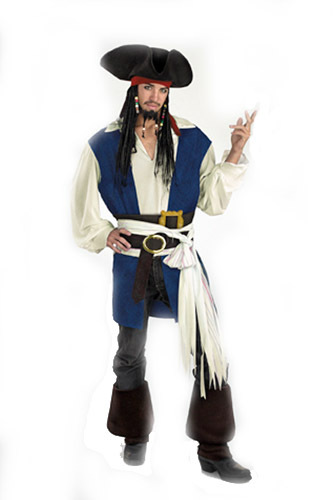 DELUXE COSTUME INCLUDES SHIRT WITH ATTACHED VEST, FABRIC SASH, TWO BELTS WITH ATTACHED BUCKLES AND BOOT COVERS. PANTS NOT INCLUDED. (HAT WITH ATTACHED BRAIDS AND MOUSTACHE AND GOATEE SOLD SEPARATELY). S/M FITS SIZE 38-40. L/XL FITS SIZE 42-46.